Every year the product lines of James & Nicholson and myrtle beach are supplemented by a lot of novelties. The same goes for 2019 under the motto: #ALLYOUNEED. Promotion, sport, leisure, business, workwear are the most important fields of James & Nicholson and myrtle beach. At PSI 2019 the new collection was launched. Customers who need large quantities can look forward to textiles in a huge selection of colours and sizes (XS-5XL) in the usual James & Nicholson quality. Classic T-shirts made of single jersey in different colours such as gold-yellow, pink, dark-green or royal are an issue as are polo shirts, sweatshirts with round neck and raglan sleeves as well as hoodies with drawstring. These products are now also available for children (XS-XXL). All the textiles of James & Nichoslon are manufactured with social and ecological responsibility, that is, they are Reach-compliant and produced in accordance with Oeko-Tex Standard 100. The year started off with the new price entry collection, however, in 2019 a lot more is planned. The extended organic cotton collection comprises a huge selection without chemical pesticides: from sweatshirts made of at least 85% combed, ringspun organic cotton, in fresh colours such as acid-yellow, orange, turquoise or lime-green to zipped hoodies or hooded sweat jackets. A natural and pleasant attitude towards life is also conveyed by the new T-shirts for men and women in maritime look, with a breast pocket, made of 100% organic cotton, in the colourways red/white, white/navy, navy/white and atlantic/white. The wide organic cotton range is extended by an organic cotton headband made of 100% organic cotton, light cotton scarfs in fashionable colourways, as well as classic socks with elastic cuffs with Lycra. Moreover, the sustainable segment is extended by a new spa collection made of organic cotton. The current trekking and sport collections will become more casual and the popular workwear will gain in functionality. In the current Jackets & vests catalogue, a lot a lot of novelties supplement the vast jacket collection of James & Nicholson, teue to the motto #STAYCURIOUS. This year, a highlight is the new 3-in-1 jacket, which consists of two parts. Both a durable, wind- and waterproof outer jacket and an easy-to-zip off, easy care inner jacket are useful in all weathers. The discreet, sporty look is emphasized by trendy colours. The 3-in-1 jacket is available in sizes XS-XXL for women and S-3XL for men. 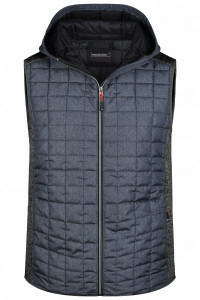 The new Knitted Hybrid Vest in stylish mixed fabrics with back-stitched check pattern at the front, at the back and on the hood addresses fashion-conscious target groups. The vest made of soft, warm material in melange look is a true allrounder for business and leisure. Trendy colourways such as pink-melange/anthracite-melange or kiwi-melange/anthracite-melange make it an attractive eye-catcher. The vest is available in sizes S-3XL and apart from that, it scores with a full-length concealed zip, a hood with size-adjustment on the inside as well as lateral inner pockets in sizes S-3XL. The casual hooded jacket in melange look is another must-have. It impresses with a comfortable interlock quality, which guarantees a high wearing comfort in a trendy hoodie-style. In the field of workwear there are a lot of new products to be discovered in 2019. Easy care and durable poloshirts made of organic cotton in an even larger variety of colours are just as relevant as are the new functional ladies’ and men’s Worker Socks for every season. With reflective elements, the Safety Cap in navy, black, neon-orange and neon-yellow ensures the necessary safety at work, this year too. The entire offer is completed by the headwear and accessory brand myrtle beach with attractively priced caps and stylish headwear from the classic allround cap in 35 colours, to the light mesh cap and the 6 panel cap in trendy camouflage look.